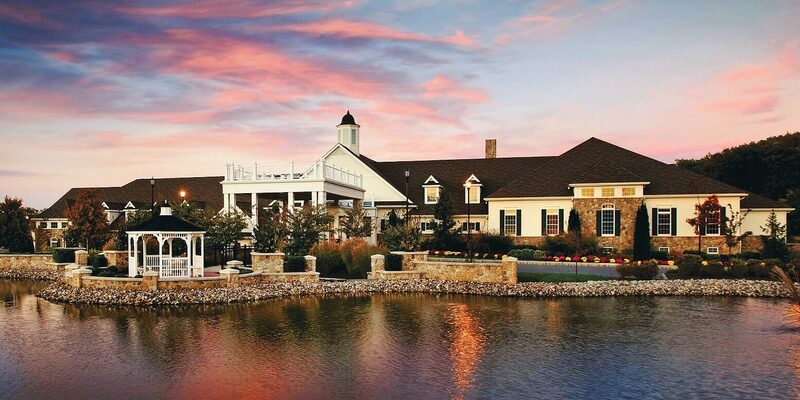 Regency at Monroe is a premier golf and tennis resort, active-adult community in Monroe Township. The community offers numerous on-site amenities, community teams and clubs, a full-time Lifestyle Director and an on-site Community Manager. You can relax and spend more time enjoying your community amenities because your low-maintenance lifestyle includes lawn and landscape maintenance, snow removal, and trash and recycling collection. Located within 50 miles of New York City and 16 miles to Princeton and New Brunswick. Regency at Monroe is currently still under construction and is anticipated to be completed by 2021. The community will consist of 1,274 single family homes comprised of 10 phases on approximately 480 acres of land. “The Association” exists to provide for: Governance, business and communal aspects by administering, maintaining and enhancing the residential development. This is accomplished through the establishment of a system of property rights, binding covenants, restrictions and rules and regulations. The Association is governed by a Board of Directors that is comprised of 6 homeowners and 1 developer representative, with an election held annually. Management has met with Comcast to create a schedule for homeowners to switch from Bulk Service to Residential. For those who have TV, Internet and Phone and do not wish to make any changes, next week we will be providing an 800 number for you to contact in order to have your service moved from Bulk to Residential. It is important that you contact the number we provide so that your address is removed from the bulk billing correctly. The following schedule is for homeowners who have ONLY 1 or 2 services and are looking to add/upgrade. Please come on your assigned date. Again, the above schedule is for homeowners who have ONLY 1 or 2 services and are looking to add/upgrade. I can’t make the date that has been assigned to my Phase, now what do I do? Comcast has designed a team for an in-home visit. This is designed for residents who would like to add additional services to their account like internet or landline. If a resident doesn’t have Comcast at all and would like to see what packages are available this Team can assist. Once received Management will place information on scheduling sheet and forward to Comcast. Will there be any more dates at the Clubhouse that I can come in and talk to someone? YES – We have scheduled Comcast to be on site November 26th, 27th and 29th. We will provide more information on these 3 dates in the future. 1. Our current service will remain live into December if Comcast requires extra time to switch homeowners from Bulk to Residential service. 2. Homeowners may begin researching current promotions on Comcast.com and self-educate on the many different services offered by Comcast. 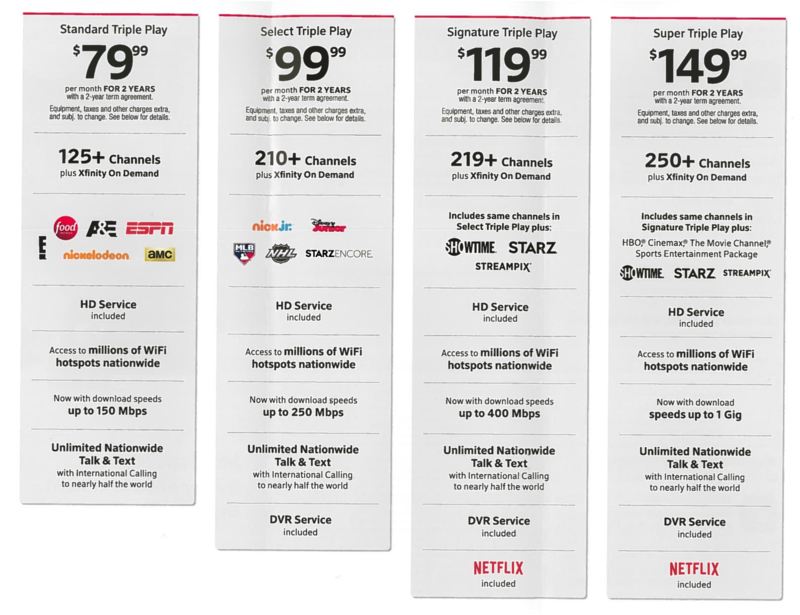 We have also attached a flyer of the current Triple Play Packages being offered. 3. Comcast has made a commitment that their Customer Service Associates will begin contacting homeowners, with 2 or more services (such as TV & Internet or TV & Phone) directly to review promotions and to facilitate sign ups. 4. Regency Homeowners will be considered New Customers and will be entitled to all promotions being offered at this time. Triple play promotion material has been attached.